One can’t help but wonder if Goethe would include nonverbal communication here I became convinced of the power of nonverbal communication by a little boy who never spoke a word to me, yet ‘talked’ to me every day (and taught me more than anyone ever has). Scientific research on nonverbal communication and behavior began with the 1872 publication of Charles Darwin’s “The Expression of the Emotions in Man and Animals.” As a result imagine the haystack I need to sort thru looking for a couple needles to share with you! I will start with the conclusion we (unfortunately) come to in business with certain individuals: the best way to know they are lying is their lips are moving. Layer on lots of other emotions/agendas we are exposed to in business and you see why we had to get at this topic early. 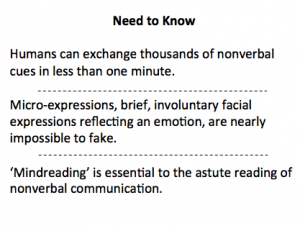 Even more striking than the numbers is how little nonverbal communication is understood. Just like verbal communication, nonverbal is involved in addressing performance, illustrating emotional conditions, enhancing relationships, providing feedback etc. We exchange up to thousands of nonverbal cues in less than one minute! So if a picture is worth a thousand words, the nonverbal part of any meeting is a book of information. 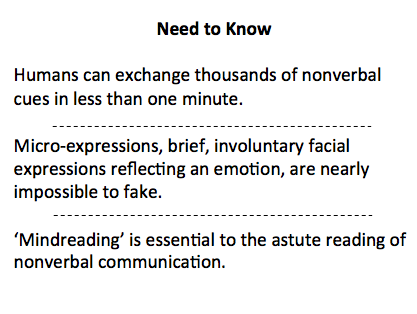 Some would argue ‘mind reading’ is astute reading of nonverbal communication. The importance of the above ratios is enhanced when you consider others almost always believe the predominant nonverbal message over the verbal one. Likely, because nonverbal cues are sent primarily from the more “primitive brain” (the limbic system) rather than the neocortex (home of verbal), they create more straightforward and revealing messages expressed via the autonomic nervous system. Clearly, our expressions have evolved with the rest of our body/mind and predate speech in the individual and the species. Conversely, our emotional (subconscious) self has finely tuned receptors. For example, think about our mirror neurons – these fire up in our brain when we do an act and when we see someone else doing that act. Spoiler Alert – I will write a future post on mirror neurons and reveal the effect they have on you as you conduct business and how you can use them to your advantage. As an aside – take a moment and think about how much critical (and even some routine) communication you are doing from a distance. What are the chances you are conveying not just your words, but your emotions? Looking back to our idea of levers and fulcrums think of nonverbal as a lever that is designed for social context. Let’s start with some of the most referenced categories and a couple examples to illustrate the concept. These are not in a particular order – take it from me they all matter. Closely tied to emotion; often involuntary and unconscious; the backdrop for other messages to follow. You will appreciate this when you get to Part Four of this series. Even the poets (not to be condescending) recognized they are the “windows to your soul.” And Shakespeare is now backed by scientific research. I am presenting this (atypically) separate from facial because I believe eyes can “direct dial” a powerful message. They are my ‘personal first try’ to interpret everyone at a business meeting. Typically conveys individual degree of confidence and status as well as receptivity. The concepts of “open” and “closed” are easily understood. For example a male power stance starts with the feet more than 8 inches apart. Natural, lively and purposeful movement creates a dynamic nature to a meeting. One well known example of gestures is “emblems” like the “victory signal”. In business, we often see another emblem using fewer fingers as a rebuttal. It does not mean they think you are #1. 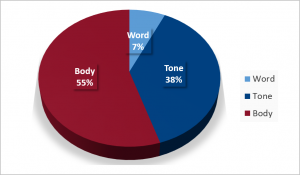 Originate from the voice, but not part of verbal including intonation, tone, pitch, speed, volume and pauses. “It’s not what you said, it’s how you said it,” refers to your paralanguage. The ‘official’ distances are interesting and to some degree cultural (see Part Two). As a closing point – the handshake is often the only appropriate expression of touch so it’s critical to have a good one. In a future posts, we will discuss trust hormones. As the saying goes we can hear what we are saying but not see what our expressions are so they are more difficult (in some cases impossible) to control. A microexpression is an extremely brief, involuntary facial expression reflecting the emotions that are being experienced. While you can fake a smile or a frown, it is near impossible to fake (or even control) a microexpression. How brief is extremely brief? Microexpressions often occur as fast as a 1/20 second. In this context, a subconscious thought happens in less than 1/25 of the time it takes to blink your eye. Nevertheless for the sake of completeness there are seven universal microexpressions for you to look for: disgust, anger, fear, sadness, happiness, surprise, and contempt. There are many books mentioned in this post and at least 45 books (five in each of nine categories) in the reference section of this website. You can find out what the others think. You can surf this site to find out what I think. But what about you? What do you think? Have you thought of something nobody else has? If so, let me know. My email is always open and I will always consider sharing unique guest posts. I look forward to hearing from you.